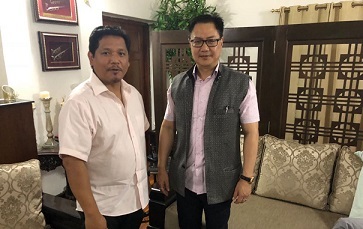 Minister of State for Home Kiren Rijiju on Monday said that the government would not take any step against the interest of the indigenous people of Assam. The Joint Parliamentary Committee is compiling a report on the controversial Citizenship (Amendment) Bill, 2016. “Once we get the report it will be thoroughly discussed,” Rijiju said. A NEWF delegation led by former minister Rekharani Das Boro, Sumitra Hazarika and Queen Hazarika also called on Delhi Chief Minister Arvind Kejriwal and raised the Citizenship Bill issue. They were reportedly assured by Kejriwal too that AAP will oppose the Citizenship (Amendment) Bill. The NEWF also launched a signature campaign against the controversial bill. Meanwhile, a pro-talk delegation led by Ulfa chairman Aurobindo Rajkhowa had a meeting with central and state government officials in an undisclosed location in the national capital on Monday. It is believed that the tripartite talks had discussed in detail about the various demands tabled by the pro-talk Ulfa leaders for an amicable solution to their problems. The Ulfa leaders also reportedly raised the issue of Citizenship (Amendment) Bill, 2016 with the government officials.